Khiron announced an acquisition that will allow the country to enter the market in Uruguay, driving the stock to an all-time high. Canopy Growth entered the U.S. industrial hemp market, obtaining a license in the state of New York. Emblem agreed to merge with Canadian LP Aleafia (TSXV: ALEF) (OTC: ALEAF). The only substantive news for the laggards was the equity offering by KushCo Holdings as well as its FY19-Q1 earnings. Following the financial report, the stock rally to the highest levels in almost a year before it was depressed by the equity offering. Note that due to its pending asset sale to iAnthus Capital (CSE: IAN) (OTC: ITHUF), MPX Bioceutical (CSE: MPX) (OTC: MPXEF) was removed from the index at the close on January 31st, leaving 42 names for the balance of the quarter. We will summarize the index performance again in a month. You can learn more about the index members and the qualifications for inclusion by visiting the Global Cannabis Stock Index. 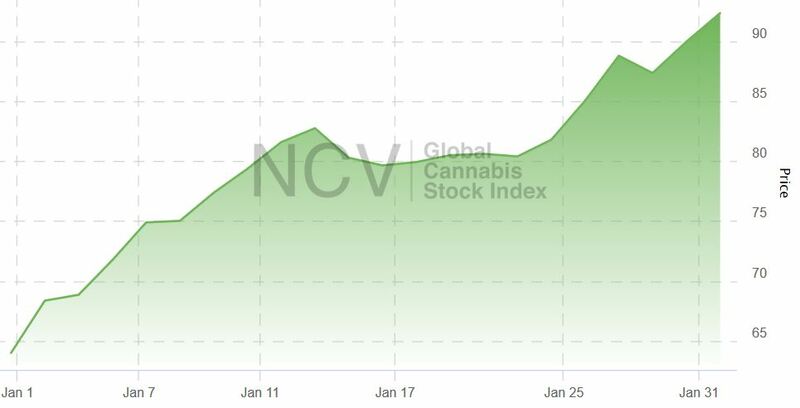 Be sure to bookmark the page to stay current on cannabis stock price movements within the day or from day-to-day. 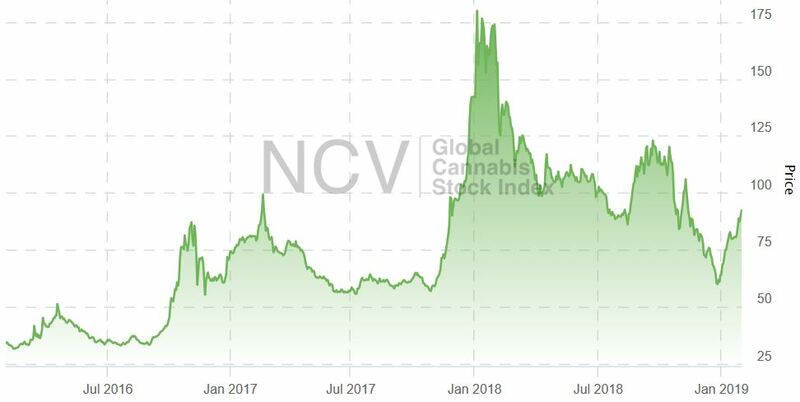 New Cannabis Ventures maintains six proprietary indices designed to help investors monitor the publicly-traded cannabis stocks, including the Global Cannabis Stock Index as well as the Canadian Cannabis LP Index and its three sub-indices. The sixth index, the American Cannabis Operator Index, was launched at the end of October and tracks the leading cultivators, processors and retailers of cannabis in the United States.